Last year we posted a note here about an unexpected small rise in barometric pressure as a severe squall passed over a boat in the Caribbean (Local Pressure as a Squall Goes By). The article served two purposes, it documented that unexpected behavior and in doing so demonstrated the value of a having high quality precision barometer on board.Today, we get to carry on with that story, but with more data. It started with a bike ride home from work, with just enough drizzle to put on rain pants. Ten minutes later however, the wind was at least 25 kts, gusting to 30, with rain heavy enough to reduce visibility to about 200 yards for a short time... not to mention an excellent test of good rain gear. This was an honest to goodness tropical squall, which I have seen many times underway... actually it was not at all a "tropical squall;" it just behaved like one. See Cliff Mass explanation of the system. After dinner and much banter about the unusual likelihood of such a squall here in Seattle, I happen to notice the trace on an accurate barometer I have at home. Screen captures are shown below. Same data, zoomed to past 3 hr, but captured at a different time. We can look at real times since this barometer has an accurate clock. The cursor is the close dotted line showing the pressure was 1008.4 at 1802 or so, just before the event. 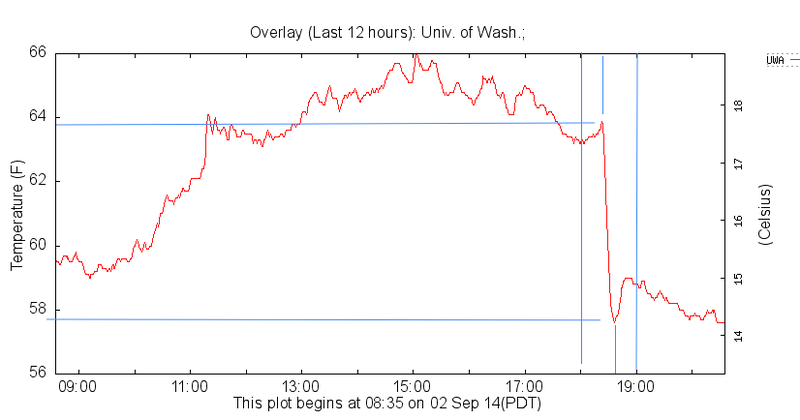 The peak pressure of 1009.2 occurred at 1813 (PDT). The pressure continued its pre-bump rise by about 1825. Thus we see that at about 1813 the pressure rose by about 0.8 mb above its trend over a period of 10 to 15 min. This instrument was roughly 25 ft above sea level, in a room with open windows, about a mile or two from the West Point Lighthouse (WPOW1), which recorded hourly (MSL) pressures of 1009.0 and 1009.7 at 1800 and 1900 PDT. 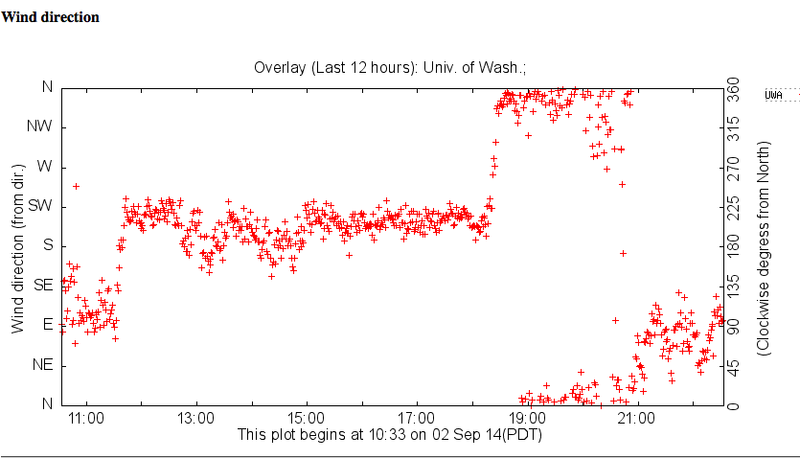 The new data here is some documentation of the squall as it also passed over the Atmospheric Sciences Building at UW, which has several fine instruments on the roof, as well as a precision barograph inside the building. In the earlier note, linked above, we speculated that maybe there was some brief pressurization of the cabin on the boat where the barometer was located, but now there is clear question about that interpretation. Namely the environment of this instrument was rather different from the boat, and also we now have the UW data (below), from an entirely different environment. High precision barograph at UW Atmospheric Sciences. 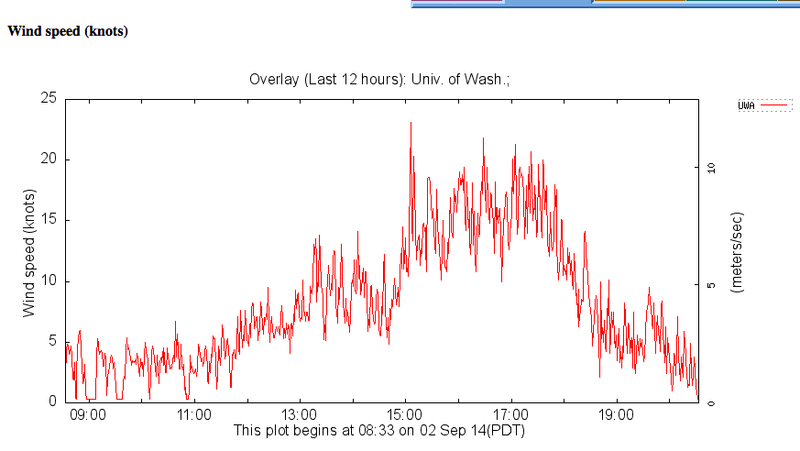 They see the same bump about 5 min later, and about half the intensity, rising about 0.4 mb. For what it might be worth, my guess is the squall was less severe when it got to UW, which is about 5 mi east of here. I say this because we have the data (below) from their measurements, and I was right in the middle of this one, on a bike, and have some experience in the observations. Unless their meter is blocked on some level, I know for certain we had much stronger winds at our location. But they did indeed have a lot of rain, but this is much harder to gauge by eye to make comparisons. I would guess what we had here for a brief time was violent rain. They recorded about a quarter inch of rain in a few minutes. This record of rain gauge bucket tips shows the downpour even more clearly. And as you would expect with a big squall, there was a fast and notable air temperature drop. Likewise as we would expect in a fast moving squall, the wind direction was all over the place. So in conclusion, we have clear proof of a squall and some estimate of its severity (there is likely other data on this as it was an unusual event) and we have two independent measurements of the pressure bump, in rather different measurement environments. Now we just have to figure out what caused this... though there is no doubt that with a good barometer you learn things you would not otherwise. For example, we can see very nicely on my home barometer the local pressure variations that lead to the sea breeze in Puget Sound on a warm clear day. Later I will write up how racing sailors can use this information to predict the wind while underway in a race on Puget Sound. PS... it is a bit difficult to tell what took place at West Point Lighthouse because they only record data hourly... but there was definitely some larger scale system in place over the region, which we will have to look up. 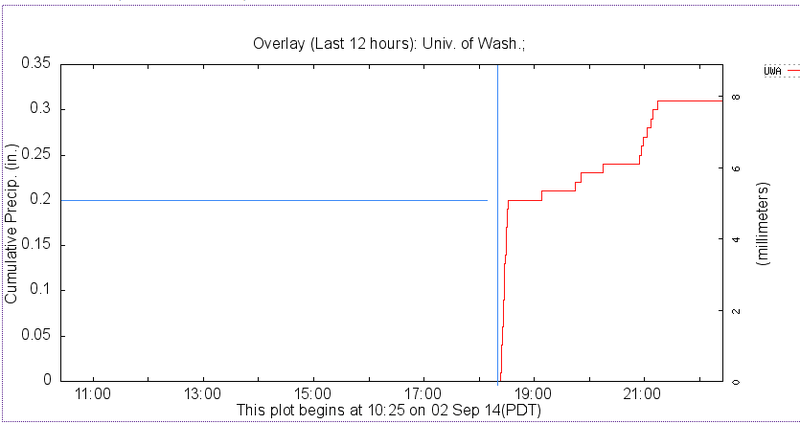 The Lighthouse data is shown below, with the corresponding pressure trace from my barometer. 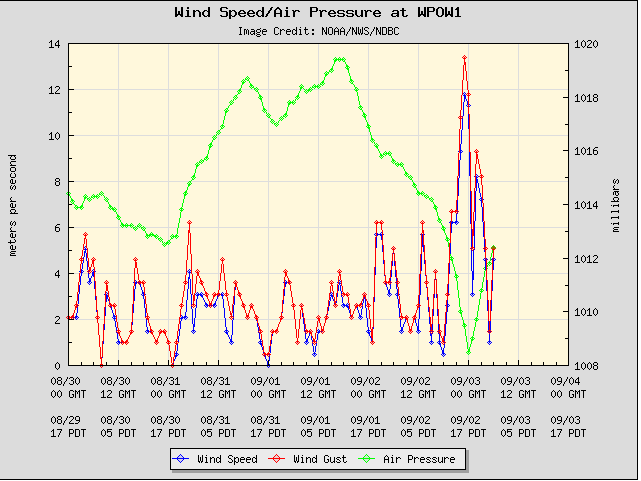 Wind and pressure at West Point. Recall wind in kts is about 2 x wind in m/s. 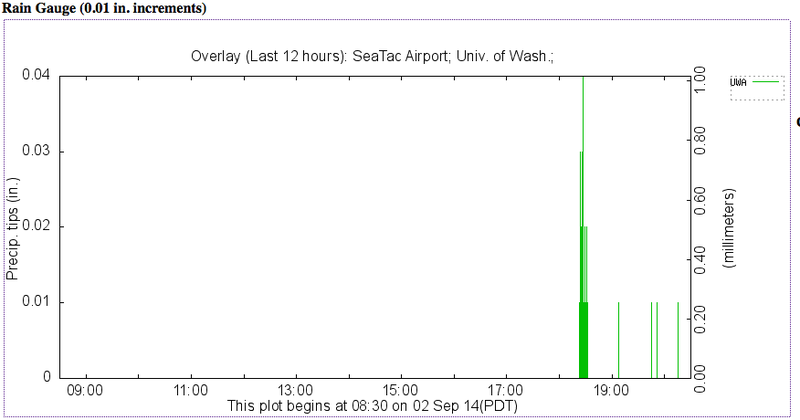 Notice that they had more wind here than at UW, and I would guess somewhat less then I experienced for a short period. 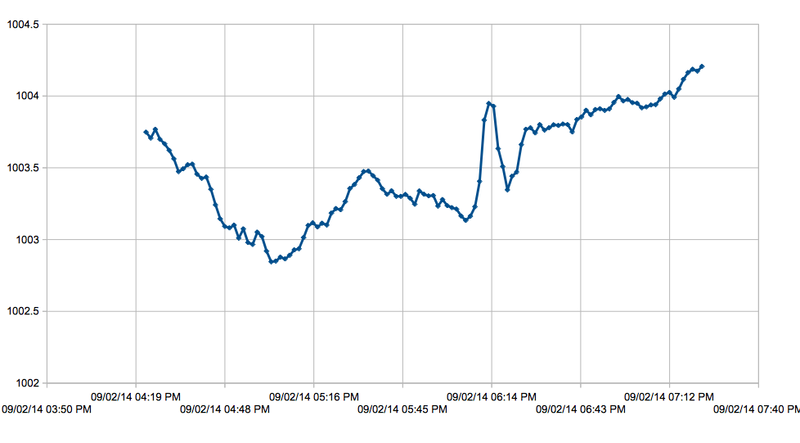 This is the corresponding pressure trace from my home barometer. We clearly cannot see the details discussed above on this scale. Follow up from the next day, Wed Sept 3. At the office we have several accurate barometers that store data, so I checked one to see if we still had detail enough to see the bump, and sure enough we see this just fine, as shown below. This illustrates three points. One is we have still another completely different environment of the instrument during the measurement, so this seems to imply this might not be the factor. And second, it seems we may have a real meteorological effect here to understand. We need to rig up our Gill Pressure port, and have this set up outside for the next squall to remove all such influences.... unfortunately (in this regard) Seattle has only some 4 or 5 squall days per year. The other important point to observe is the great value—for research and careful foreacsting—of a barometer that can store digital data and then transfer it to a computer for archiving or further analysis. There are several units on the market that will do this, and some phone barometers can export the data as well. The barometer in the Kestrel 550 hand held wind meter, for example will even blue tooth high precision barometer data to a phone or tablet. This is a rapidly changing technology and high precision barometric pressure is now readily available. In the above example, 24 h ago, this bump was just barely visible on the crude display screen of the instrument itself, but we could just connect it to a computer with a USB cable, export the data to a spread sheet and plot it. The whole process took just a few minutes. Most tidal currents we deal with on inland waters are reversing currents. That is, from slack water the current builds in the ebb direction to a peak value, on average about 3 hours later, then it starts to diminish in speed back to another slack—and over this full ebb cycle the current is flowing in more or less the same direction, tabulated as the ebb direction. Then the current reverses, and carries out the same pattern in the tabulated flood direction. Usually in a reversing current, the ebb and flood directions are nearly opposite to each other, but it is not uncommon to be out of alignment by 10º or so, and in extreme cases as much as 45º—but even when misaligned there are these two unique directions that define the set in a reversing current. In stark contrast, there are some locations in open inland waters, and in essentially all coastal waters, where tidal current behavior is quite different. These currents are called rotating currents. A pure rotating current rotates its direction of flow over the tidal cycle without changing speed. In a pure rotating current there is no peak current speed and no ebb or flow direction. A pure rotating current, however, is rare. In most cases the current speed does change somewhat as the current rotates, and thus the pattern of the flow is not a circle, but an ellipse, in which case the long axis of the ellipse can be thought of as defining the ebb and flood directions, as well as the peak values to be expected. The rotation is created by the interaction of two tidal waves moving in different directions. Either one of these waves on its own would create a simple revering current, but where these waves cross the resulting current shows a rotation pattern at that location. The shape of the rotation pattern depends on the relative amplitudes, times, and directions of the crossing tidal waves. In the Northern Hemisphere the rotation is usually clockwise. Running farther into a large open estuary with various channels, the same tidal waves will later create reversing currents. A key point for navigators is to know and expect this different behavior of the current once sailing into large open bays or into coastal waters. Sometimes the official NOAA Tidal Current Tables alerts us to this with reference in the list of secondary stations to special tables or diagrams for rotating current stations, but in other parts of the world there is no warning. We just have to know it happens and search through the references for the data. On some Canadian charts, rotary current diagrams are printed right on the chart at the pertinent locations, but we do not see this often on US charts. Once we know the current rotates where we care about, and we find the data describing it, we are faced with how to use this information. The procedure for figuring time, set, and drift of a rotary current is different and more involved than is the same process for a reversing current. For a reversing current, we go to the Tidal Current Tables, find the nearest station, and look up the peak and slack times and speeds. Then use the interpolation table from the book to figure speeds at other times or use a shortcut like the Starpath 50-90 Rule. Or much easier, go online to tidesandcurrents.noaa.gov/noaacurrents/Stations and look up the data already corrected for secondary stations. Or easier still, open an echart program that includes a tides and currents utility, and click the place on the chart you want, set the calendar and clock, and read off the current for that specific time, or print a plot of current versus time for a day or so. This feature of electronic charting is one of its strong selling points for those who sail tidal waters. For rotary currents, however, none of these easy methods work. Furthermore, you must have the official NOAA Tidal Current Tables at hand. Abbreviated versions rarely have the needed information, and it is not online, and it is not included with echart current utilities. Rotary current predictions are too complex to be tabulated, so we are left with approximations. To show the process, we look just SW of Cuttyhunk Island in Rhode Island Sound (Current station #749). A section of Table 5 from the Current Tables shows how this current rotates at this location. The currents are not strong at this location, but other places rotating current can be quite strong. On Nantucket Shoals or the entrance to Strait of Juan de Fuca, or many places in Alaska rotating currents can routinely be well over 2 kts. Also note that within just 3 to 6 miles of this rotating current there are 3 stations with purely reversing currents. One just inside Buzzard’s Bay (#773) and two just inside Vineyard Sound (#747 and #745). There are numerous examples around the country where pure reversing switches to rotating in just a few miles. The main reference to using the data are the Instructions to Table 5 in the Tidal Current Tables, but I venture to guess that not all navigators who might benefit from the information have seen them, so we offer a brief summary here till they get a chance. The current speeds shown in Table 5 are the monthly averages. The times of each current are relative to the time of max flood at Poll0ck Rip Channel, which is a primary reference station in this area. Thus that one time sets the times for the currents at each hour after that. 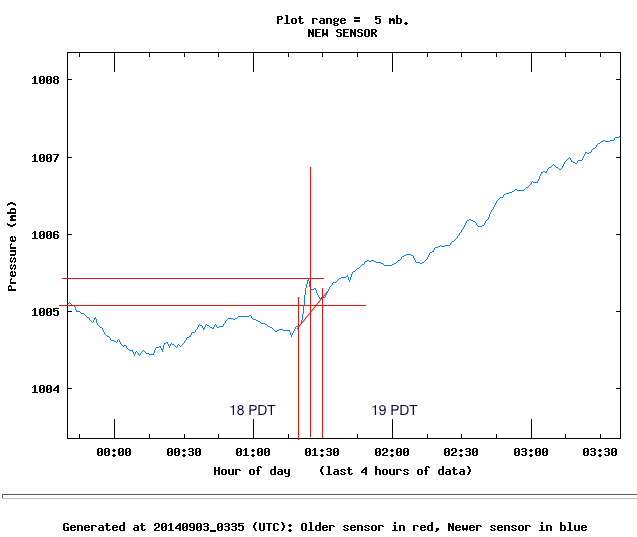 If for example the max flood at Pollock Rip occurred at 0551, then the average Cuttyhunk current at 0951 (4h later) would be 0.5 kts, setting toward 146 T. Since we know the current each hour, if we knew the time period we expected to be in this current we could figure the net tidal vector and from this figure our CMG and SMG as we transited the area. But we are not done. These are average speeds, and just as with reversing currents, the speeds are stronger at spring tides (new moon and full moon) and weaker at neap tides (quarter moons, which appear in the sky as half-moons). As a rough rule, spring tides give rise to currents about 20% larger than the average, and neap tides yield currents about 20% lower than the average at any particular location. And this can be fine tuned even farther taking into account the location of the moon in its orbit at these phases. When the moon is closest to the earth (perigee) at the springs, the x 1.2 factor increases to x 1.4, and when the moon is farthest from the earth (apogee) at the neaps, the x 0.83 factor (1/1.2) is reduced to x 0.71 (1/1.4). With reversing currents we do not have to worry about this. The astronomical influences are built into the current table predictions. But for rotating currents we get only the averages and have to apply the astronomical corrections ourselves. The needed astro data are on the inside back cover of the current tables and also online. This year, for example, July 12 is full moon and July 13 is perigee, so we expect currents throughout the region to be some 40% larger than average on these days, which you can see in the current tables for all reference stations in the region. On these two days, however, we would need to increase the tabulated rotary currents by this factor ourselves. 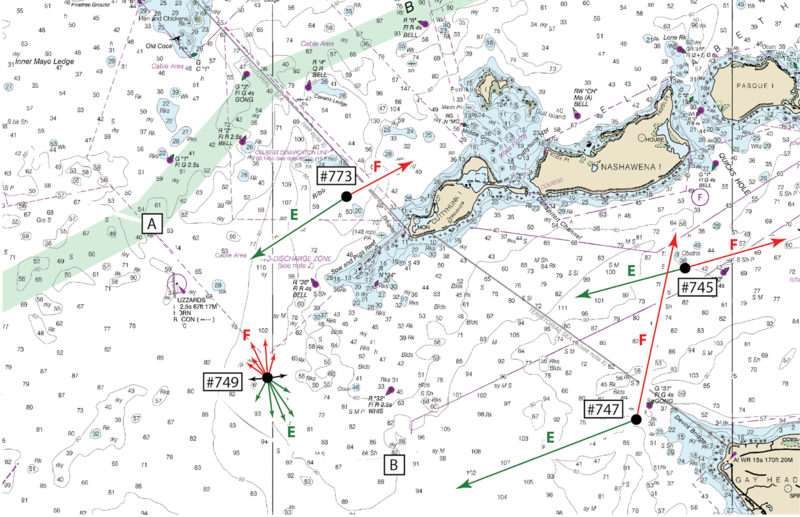 Section of chart 13218 showing four current stations, three are reversing, one is rotating (#749, Cuttyhunk Is, 3.25 mi SW). The average speeds at the stations are shown to scale, with the average ebb at #747 being 2.0 kts. The current predictions are for the precise location of the station dots, not along the arrows. Away from the precise station locations we must infer the currents from neighboring predictions. We might expect the converging max ebb currents near point B to be near southerly, with some element of rotation. The current NW of #773 is similar to that at #773, but we can expect the peak flood current near point A to be curving to NE with some element of rotation. An echart program with a range and bearing tool is an easy way to make a rotary diagram as shown above. The vectors correspond to the ones shown in Table 5. We have exercises on rotary currents in our new Navigation Workbook 1210 Tr, which are discussed in more detail in our text Inland and Coastal Navigation.